Search.bytefence.com is the PUP that uses misleading techniques to prevent removal. Use Reimage to locate malicious components and get rid of them faster than with uninstall instructions. A full system scan blocks virus reappearance and prevents traffic to malicious domains. Should I worry about an unexpected appearance of Search.Bytefence.com? How can I prevent installation of this search tool? How can I safely remove Search.bytefence.com from my browsers? Search.bytefence.com virus is a wrongly used phrase, and users should stop calling this search engine like that. It is a legitimate search tool that gets installed into user's browser after the user downloads and installs ByteFence Anti-Malware software (developed by Byte Technologies LLC). It is part of the software and users always have the right to opt it out when installing the legitimate anti-malware program, however, not many users pay enough attention to the information provided by software installers. Usually, the installer of ByteFence software suggests changing your homepage, new tab page and default search settings, which means that all of them will point to that customized search engine. No matter if you're using Mozilla Firefox, Google Chrome or another popular web browser, it is likely that its settings will be altered in order to make you use that certain search engine. Despite that its functionality is normal and it is unlikely to provide you with dangerous search results, you might not want to use it, and that is completely okay. If you wish to remove Search.bytefence.com, you can easily do it on your own – just make sure that you carefully read the instructions given below the article. We prepared them in order to help you to complete the removal process without hassle. Although this search engine is not dangerous to use, there are many browser hijackers that sneak into user's computer when bundled with random free programs and users should be aware of them. Usually, they meddle with the parameters of Internet Explorer, Google Chrome or Mozilla Firefox browser, just like the described ByteFence component does. Actually, the search engine that the aforementioned anti-malware tool promotes enters the system without a CLEAR permission asked, and we do not think that it is a tolerable activity. Sure thing, if you find it useful, you can use it, however, we noticed that many users start looking for Search.bytefence.com removal guidelines shortly after installing the related anti-malware software. Therefore, we usually advise users to use other anti-spyware or anti-malware tools like Reimage or Malwarebytes MalwarebytesCombo Cleaner for computer protection, because these programs do not configure browser's homepage, new tab and default search settings for their own benefit. The described search engine might be pushing sponsored search results or even pop-up ByteFence ads to users in order to generate pay-per-click revenue. However, as we said, if you weren't looking for a new search engine, there is hardly any reason to keep it in your system. You can leave the anti-malware on the computer if you want and remove the component that controls your browser's settings only. Instructions on how to do it are provided below the article. Researcher demonstrates Search.bytefence.com search engine. If this page appears each time you launch your web browser, it means that you have installed Bytefence software along with the system tool that controls your browser's settings now. Example of online advertisement generated by an ad-supported program. You might start getting various ads after installing ByteFence Anti-Malware, however, most of them will advertise and promote the full version of the software. Another fact that concerns us is that the described ByteFence Redirect tool records your browsing-related information like search queries, websites you are visiting, IP addresses, computer locations and other things you might not like sharing with someone you do not know. Such information might be used for market research or even shared with third-parties. Technically, it is legal to do so, because such information is considered to be personally non-identifiable. However, small details such as your search queries can contain sensitive data, which is going to be collected along all other terms and phrases you used in your searches. To stop such activity, you will only need to uninstall the described potentially unwanted program (PUP) that sneaked along the ByteFence software without your knowledge. The Search.ByteFence browser addition usually comes alongside the anti-malware software that promotes it. These programs are connected using software bundling technique, which allows to group and distribute several pieces of software together. The technique is considered to be legitimate; however, in most cases, installers of such software packs fail to adequately disclose the existence of additional programs, so consequently, users install them unknowingly and then start complaining about suspiciously behaving web browsers. To prevent this, you should be very attentive when downloading free programs. Although the described search tool is not dangerous, there are other and more critical browser hijackers that are also distributed using the same bundling technique. When installing new programs, you should always choose Advanced or Custom options, and then deselect all programs that you do not want to be installed. We suggest you avoid suspicious free programs and download managers because they are notorious for distributing bundled programs and they receive revenue each time such bundle is downloaded and installed. Do not choose Default or Standard settings, ever – they are usually filled with permissions to install extra programs and there's no way to reject them. What is more, you should always download programs from their official websites as this will also diminish the risk of getting you computer infected. However, keep in mind that some free programs are designed specifically to lure people into downloading them so they would download PUPs as well. Therefore, trust your best judgment on what to download and what might seem suspicious. 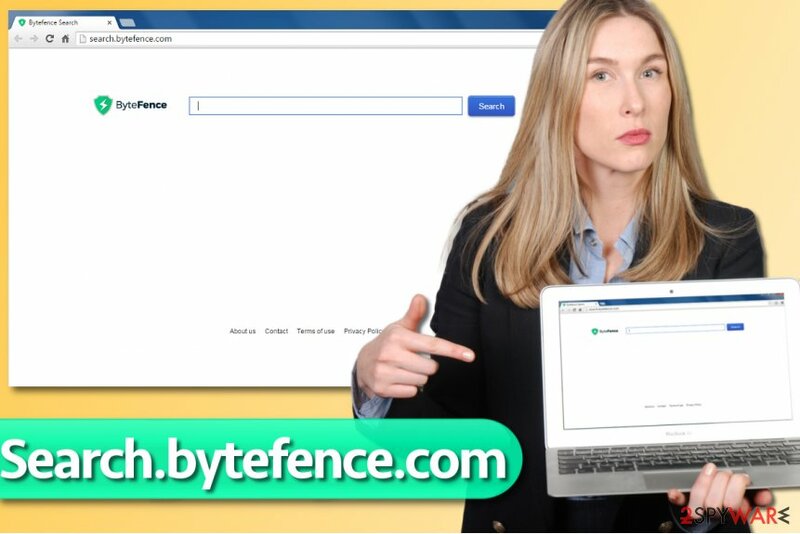 The described search tool is likely to be controlled by a certain browser extension that was installed during the installation of ByteFence, but the anti-malware software could have modified your browser's shortcuts to make them point to Search.bytefence.com search engine. Remember – these extensions are not viruses, however, their presence usually is objectionable, so if you no longer want to use the new search engine and get back to your old habits, you should remove Search.bytefence.com right away. You can use anti-spyware software for Search.ByteFence removal, or you can read these instructions and eliminate the intruder on your own. The instructions provided below clearly describe all steps that you need to complete if you wish to remove the described search tool from your system. Do not forget to clean browser shortcuts as shown below. After completing these steps, you should start fixing each of web browsers individually. Here, look for Search.bytefence.com or any other recently installed suspicious programs. Wait until you see Applications folder and look for Search.bytefence.com or any other suspicious programs on it. Now right click on every of such entries and select Move to Trash. When in the new window, check Delete personal settings and select Reset again to complete Search.bytefence.com removal. Once these steps are finished, Search.bytefence.com should be removed from your Microsoft Edge browser. Firefox can start causing redirects to the described search engine as well, and if it does, you should carry out these instructions carefully. Here, select Search.bytefence.com and other questionable plugins. Click Remove to delete these entries. Now you will see Reset Firefox to its default state message with Reset Firefox button. Click this button for several times and complete Search.bytefence.com removal. In Chrome, you should find one or couple browser extensions added without your knowledge, so make sure you remove them. Here, select Search.bytefence.com and other malicious plugins and select trash icon to delete these entries. Click Reset to confirm this action and complete Search.bytefence.com removal. Here, select Extensions and look for Search.bytefence.com or other suspicious entries. Click on the Uninstall button to get rid each of them. Here, look at the Homepage field. If it was altered by Search.bytefence.com, remove unwanted link and enter the one that you want to use for your searches. Remember to include the "http://" before typing in the address of the page. Now you will see a detailed dialog window filled with reset options. All of those options are usually checked, but you can specify which of them you want to reset. Click the Reset button to complete Search.bytefence.com removal process. ^ Chris Hoffman. How to Avoid Installing Junk Programs When Downloading Free Software. How-To Geek. For Geeks, By Geeks. ^ John Leyden. Search engine results increasingly poisoned with malicious links. The Register. Sci/Tech News for the World. ^ Gabriel E. Hall. What are browser hijackers and how to remove them. 2-Spyware. Information About Viruses and Cyber Security News. ^ Classifying Potentially Unwanted Applications. F-Secure Labs. Information Source for New Virus Hoaxes and False Alerts, with Searchable Virus and Hoax Description Database. This entry was posted on 2017-04-18 at 01:27 and is filed under Stealing programs, Viruses. You can quickly scan the QR code with your mobile device and have Search.bytefence.com manual removal instructions right in your pocket. How did you remove Search.bytefence.com?